Our poor little herding dog, Acer, has had to tolerate our boring, slow-moving, exasperated selves since she was a wee pup. Before she met our neighbor's herding dog, who has an obsession with chasing aerial critters (i.e. birds), she was somewhat satisfied with racing after tennis balls and frisbees, when we found some time to indulge her. But for at least the last calendar year, we have been saying to each other, "Poor Acer, she really needs some goats or SOMETHING to herd". She chases the barn swallows, who are nesting in our shed eaves, and who fly recklessly about. She chases the frequent Turkey vultures as they wobble overhead. She chases the hawks and the kites, and the songbirds who hide in the bushes. She DOES manage to keep the deer out of the garden, but they still manage to snip the tips off of our escallonia while she sleeps peacefully on the porch of the shed in her doggie bed. If we ignore her for too long, she will take off on her own adventure, as if to say, "To heck with you, I'M going for a walk." 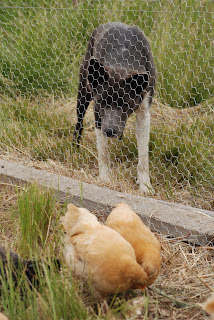 Well, you can imagine the delight of this little herding dog, when she discovered we had chickens. We've been a little worried from the get-go, since she killed two of Cedar's unsuspecting chickens who were free-ranging when Drew showed up an unleashed Acer. When ours were three-day old fluffballs, Acer froze, quivering over the box, with drool dripping out of her licking lips. Uh-oh. When we moved them to the shed, she would race over everytime we opened the door, and intensely stare, shivering with concentration and excitement. When she is in this state, she loses most of her ability to hear our commands. Now that we have moved the chicks outdoors into a fenced run, Acer spends most of her day "pointing" and then running a lap around the birds, presumably to gather them up. Unless they're right next to the fence, they don't seem too bothered, and our little herding dog AT LAST has something to round up. I call it "dog television". Happy happy dog...I'm not sure it's sinking in, but I am attempting to continue working on training, asking her to lie down and stay until I release her with "OK!" to run her lap around the coop. It remains to be seen what would happen if she could actually touch one with her nose. Maybe we shouldn't explore that.